What do Attack of the Show (the Orageek of Delphi) and Stephen Schwartz (the composer/lyricist of Godspell and Wicked) have in common? They both follow me on Twitter, and I always assume that’s most likely to be because of ILMK. I say “us” instead of “me”, even though that might seem contrived, because I consider this blog in some ways a group effort. I write the posts, but there is a feedback loop, like a live performance. If the readers weren’t the same, the blog would be different It’s evolved over time, and you are part of that. Thank you. Anyway, can’t you just see Kevin Pereira and Stephen Schwartz discussing second act hooks and MMORPGs? I was just honestly impressed that AOTS was following. It’s like the day that ILMK passed both The Onion and the Huffington Post in ranking at the Kindle store. Still, there is this odd phenomenon that e-books are making reading cool. Geeks and musical theatre are cool, right? This appears to be one article from the magazine: 97KB. What’s the Least I Can Believe and Still Be a Christian? Amazon is changing the game…again. Look, they don’t have to keep giving us more free stuff…but it makes us more loyal customers. Seriously, I don’t recommend you risk your relationship with Amazon by breaking your Terms of Service. That includes installing “hacks”, by the way. You’d be amazed what you might miss afterwards. I’ve never heard of Amazon going after someone for using a hack, but they could. Let’s first deal with the one that doesn’t immediately impact you with the Kindle. Amazon has created a “cloud player” for the web and one specifically for Android. It lets you play music that you store with them…from anything with a browser (that can do streaming music). I’ll probably use this. I currently have some music on my Kindle, and that works fine. However, the current K3 doesn’t have much volume, and playing the music does run down the battery charge. It would be nice to be able to play it from any computer. That’s not downloading the music, by the way: you aren’t going to take up a bunch of memory on someone else’s computer, and your company might not appreciate you downloading music (some of them won’t appreciate you streaming, either, of course). So, it does affect my Kindle a bit, by possibly freeing up memory on my Kindle. I do, though, listen to this music in the car sometimes (I’m far more likely to use text-to-speech, but I do music sometimes). I’ll probably keep some music on my Kindle for convenience sake. There is a player for the web and one for Android devices. I tested it with my SmartPhone. It worked fine…I was running it on wi-fi. Be aware of data charges from your carrier when streaming music. The player does MP3s…it doesn’t do .wavs (I have some music in that format), and the music that’s in your iTunes would have to be converted, I believe. So, you could store up to 5GB of music for free Amazon…and listen to it on any web-connected computer with a streaming audio browser. Note that all you have to do is buy an MP3 album, and they’ll up that to 20GB (only for one year, though…after that you would pay. Thanks to my reader Common Sense for making that point). Here’s the other really key thing: MP3s you buy (from here forward) automatically go to your cloud storage…and do not count against your storage space limit! Yes, you have free unlimited music storage, as long as you buy your MP3 music from Amazon. That’s somewhat similar to the storage we have for Kindle store books…free and unlimited. Is that going to encourage people to buy from Amazon rather than, say, Apple? I think so. That brings us to the other part of this, and to me, a really interesting one. You probably won’t see it in most of the headlines for today’s move, but I think it’s possibly more important than the cloud player. 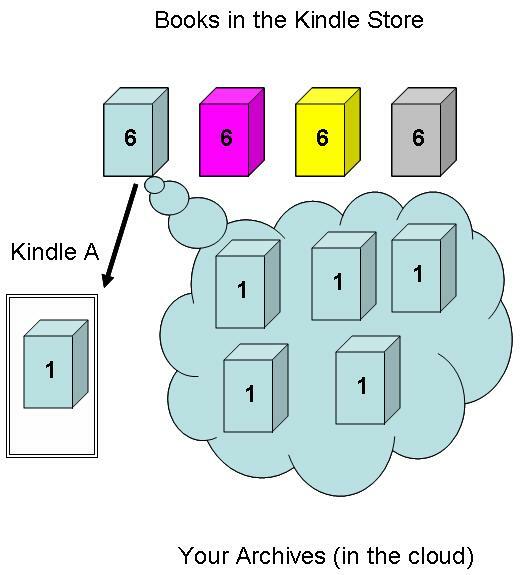 Amazon is giving you 5GB of storage (more than your entire Kindle’s local storage) in the cloud. You’ll be able to store any digital files. Keep that manuscript on there, and work on it in the hotel’s business center. You won’t have to carry that PowerPoint on your jump drive. In fact, I would guess this may seriously hurt jump drive sales. I use those to move files from one computer to another…this eliminates that need. My employer recently installed Credant on all our machines…meaning we can’t save to a jump drive without putting a password on it. That’s sort of a bother, and I largely won’t need to do that now. Some of you have http://www.dropbox.com …this is similar, although Dropbox allows for easy sharing and syncing files on your devices, and that doesn’t seem to be the case here. Dropbox has a free program…why wouldn’t I just use that? That makes a difference to me. I’ll be able to get to it from anywhere I could shop at Amazon.com. I won’t need to install anything or do anything special. Now, some of you sharp-eyed folks might have been wanting to correct me for saying “any digital file”. There is a size limit, but there is a more important limitation. No illegal files…you assert that you have the right to copy the file to that drive. I think this has some very interesting possible implications. If you put illegal copies of Harry Potter up there, could Amazon stop doing business with you? I presume so. They can’t let you do it…they would get in trouble for it. Interestingly, I would also presume that you are guilty of a federal crime at that point. Amazon is famous for protecting customers’ privacy, but if the Feds had a warrant to search your cloud drive, they’d have to let them do it. This is a little complicated, and I want to stress that I’m not a lawyer. Copying is generally a right reserved for the copyright holder (with certain exceptions). You infringe on the rights of the copyright holder if you copy a file without the rightsholder’s permission. Having an unauthorized copy on your computer is, according to the Supreme Court, not the same as having stolen goods. Copying the file is illegal (with certain exceptions). Downloading an unauthorized file is not, as I understand it, illegal…although I still don’t approve of doing it knowingly. However…in this case, you are copying it to Amazon’s cloud drive. Certainly, if you copy it to your cloud drive and then copy it from there to somewhere else, you could have a problem. I’m not planning to use it for copyrighted material…unless I own the copyright, as with my own material. That’s the big plus for me. I’m currently working on a couple of things I’m writing. I tend to work on them on the same computer…this could change that. Note: your Kindle doesn’t do streaming audio, so I don’t think you’ll be able to use the cloud player on that. When Borders filed for bankruptcy, there was a list of stores that were being closed. In my area (the San Francisco Bay Area), it was mostly the big, high-rent stores…Union Square, Santana Row. My local Borders wasn’t on the list and has been open. I went in today…everything was on sale, and magazines were 40% off. I’d like to stop buying paper magazines, but I haven’t quite done that yet. An Amazon tablet would probably take care of that habit…if it had things like Famous Monsters of Filmland (I bought a copy today). There is a digital version of that, so I’m hoping. While I was waiting in line, I could hear the conversation of the salesclerks and the customers. I wasn’t trying to do that…and I really only heard the salesclerk (they are facing the line). 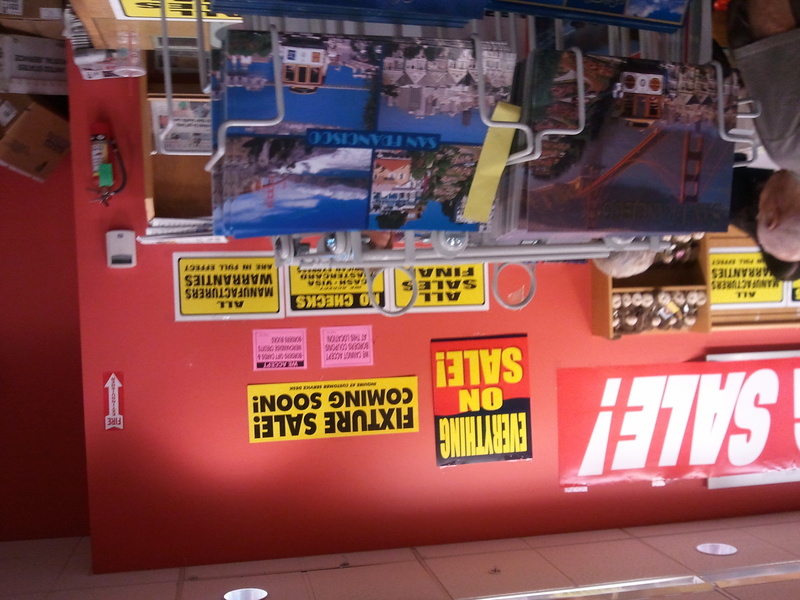 Besides the fact that somebody bought more than $700 worth of stuff (and fixtures aren’t on sale yet), there was talk about the situation. They confirmed it as a second round of closing. All of the ones in my area are closing…after this wave, the closest one will be something like thirty miles away…and not in a direction I’d go casually. It’s possible that I’ll never go into a Borders again (although they’d have to close another one I use to make that happen). That does give me a bit of a catch in the throat, although I know it makes sense. Yes, I read my Kindle in line at the closing of the Borders. 😉 It’s not the Kindle’s fault, though, not entirely…Borders, I believe, would have been in trouble anyway. Maybe not as soon, but they weren’t adapting quickly enough to changing conditions…which would have been hard for them. Not just e-books, of course…Costco, Amazon online for paperbooks, and so on. The place was busy, but these were the same employees handling the closing…not a liquidation company. As you can see from that (maybe), they weren’t taking Borders coupons or checks, but otherwise, things were as you would expect if they weren’t closing. The new stores are highlighted with closing dates…drat, they are closing my other regular one! 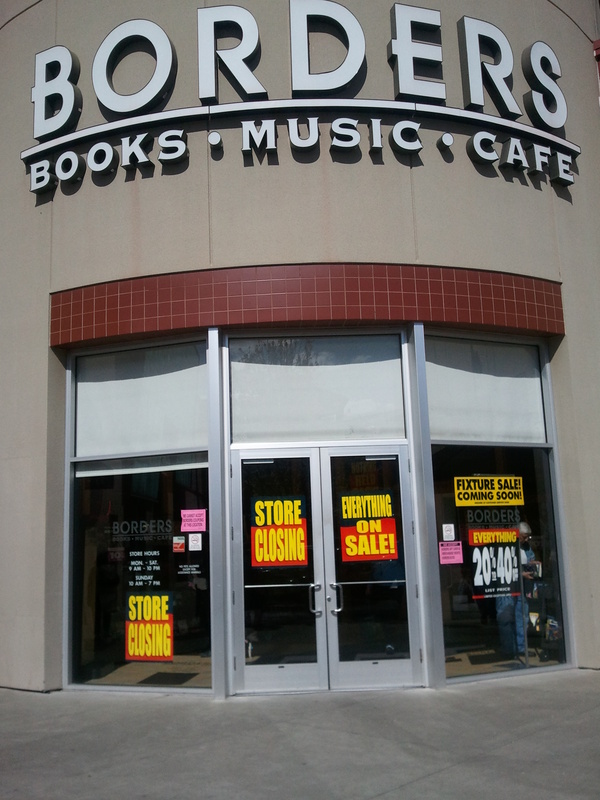 That means I might have been in my last Borders…here’s a story I wrote about what it might be like after bookstores close. Flash! Kindle DX on sale in brick-and-mortars: tablet coming? Thanks to Nelson T. Champine in the Amazon Kindle community for the heads-up on this! Best Buy has an in-store only sale on the Kindle DX Graphite for $299 ($80 off). Nelson also mentioned Staples, but I’m not seeing that. If it is at more than one chain, it suggests that Amazon is driving the price (although the DX is not reduced at Amazon at time of writing). That, in turn, may be to make room for another product. While that could be a new Kindle DX, it could also be an Amazon Android tablet. There have been several indicators that one might be coming (Amazon job ads, the Amazon Android Appstore, Amazon having bought a touch screen company some time ago). I’ll keep my eyes open and let you know. I’m champing at the mental bit for an Amazon tablet! Dame Catherine Cookson (AKA Catharine Marchant) sold more than 100 million copies of her novels, and according to Public Lending Right, was the most borrowed author from UK libraries (with over 1 million loans) in 2001-2002…and was the top for 17 straight years. There have also been more than twenty TV adaptations of her works. that they will have the exclusive e-book versions of 91 of her books (available both from Amazon.com and Amazon.co.uk). are from Peach Publishing, and range from $2.99 to $5.99 (in the US store). It’s also interesting that Cookson died more than a decade ago, presumably meaning this deal was negotiated with the estate. That’s important for the goal of “every book ever written”. You need the ability to make those kinds of deals to make that happen…or wait until books fall into the public domain, which can be decades. While the lending feature for Kindle books is pretty limited (largely in the same way as the LendMe feature for the NOOK), some people do take it into account when they buy books. Amazon hasn’t given us an easy way of which I know to find books with that capability. Well, I did find a way that works pretty well when PokerRun3 asked me on my Amazon Author Central page. That will find you books that have the lending enabled. It will find you other things, too, like discussions about the issue, but it worked pretty well. However, that is out of “only” 886,343 titles in the Kindle store. Could it be that only something like 30,000 books aren’t lendable? I’m guessing not…I think it’s some issue with the search results (maybe it could report a book more than once…if there were tags on the page, for example). “Active Content” continues to be added to the Kindle store. However, once you get there, you can’t search within the category or see all of the items in that category. In fact, this page is actually labeled “Popular Games & Active Content” which is what appears to be…not all of them. When you go to bestsellers, you can’t choose Active Content as a separate category. What this means is that it is kind of hard to find the titles, even if you know the name of one. You can’t sort by publication date or bestselling. This may affect sales…it seems to take Amazon a few days before something shows up in the places they promote Active Content. That was apparently true for the Notepad app from 7 Dragons. I’d written about it, as had some other bloggers. The app did well, and was well-reviewed (that’s still true: it has 49 5-star reviews, 5 4-stars, and 3 3-stars at time of writing…that’s an average of 4.8, a very high score). I don’t think it was until Amazon mentioned it, though, that it shot to #1 paid in the Kindle store (it’s #6 right now). It also appears to take them a bit of time before something gets a sales-ranking. That means it helps a lot in the beginning when a game/app publisher lets the Amazon Kindle community know. He was also nice enough to drop a note at my About page for this blog. This one is a variation on Sudoku. In addition to the normal idea of Sudoku (placing numbers in a grid without repeating the numbers in a row or column….there’s more to it than that, but that’s the basic idea), this version also has “streams” that meander through the grid…which also require unique placement. I’m not sure if that’s going to enhance the appeal. I’ve never really gotten into Sudoku, but I had the sense that it was the…linear nature of the game that was partly attractive. If you try these, feel free to let me know what you think. I’m particularly interested in how kid-friendly Checkers is, and how Strimko appeals to Sudoku fanatics. You can buy these games once and share them with all compatible devices on the account. I’ve written before about the archives at Amazon and about shared accounts (both of which come into play here), but I do still see a lot of confusion about simultaneous device licenses. So, I thought I’d do a post specifically about that concept. I apologize in advance for my images…not my area of strength, but I know it helps some people get it. When you buy a book from the Kindle store, you get a certain number of “simultaneous device licenses”. 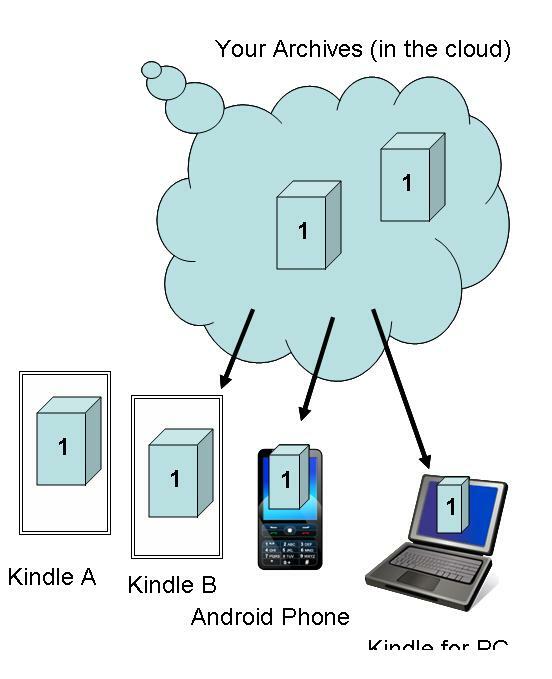 That is the number of devices for which the book can be licensed at the same time by you. That means that when you buy the book, you are allowed to put it on six devices registered to your account at the same time. You don’t actually do it all at once…you download for one and then another, but if you have six licenses, you have to stop at six devices until you free a license (see below). Books can have any number of simultaneous devices licenses from one (rare) to unlimited (public domain titles may have this, as well as the minority of books where the independent publisher has chosen to do them without DRM…Digital Rights Management). 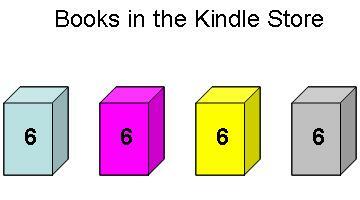 If the number is other than six, it will say so on the book’s Amazon product page. If the number is six, they actually don’t say it on the page. If you don’t see a simultaneous device license number, it is six. When you buy the book, you specify a device for which it is intended (licensing the book for that device). It will typically download wirelessly to that device at that time. You can download it to your computer instead for transfer to the Kindle later, if you don’t have a wireless connection available. That device gets one of your licenses. That leaves you with five licenses. Those go into your Amazon archives. The other devices registered to your account can download the book (using up a license each time). They can find the books that are available to them through the Archived Items (in the homescreen on the Kindle: it could be in the menu or on a button on the Kindle reader apps). Note that the Archived Items list on the device won’t show items that are already on that specific device. It shows you what books are available for download to that device from the archives, and if you already have a book on there at that time, you can’t put it on there twice. and send the books from there to the devices on your account. Again, each time you license a book for a device, you eliminate one license. 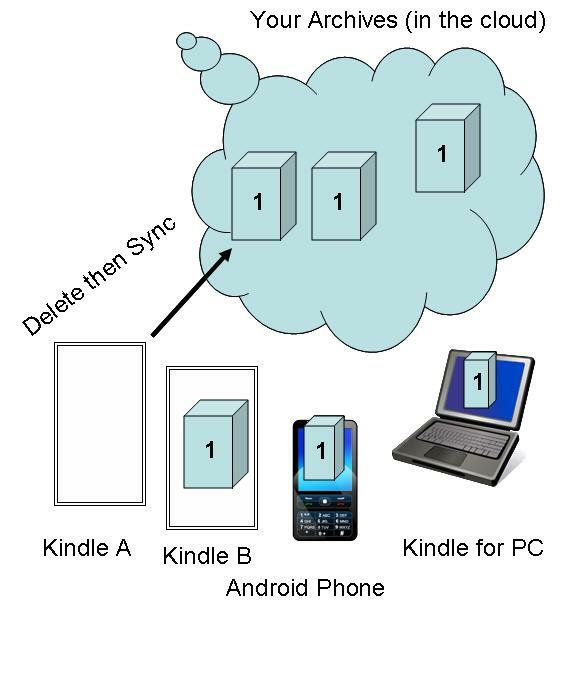 Let’s say you download the book from your archives for a second Kindle, a Kindle for PC installation, and a Kindle for Android installation. You would have used four licenses: the one you did originally when you bought the book, and the other devices. You have two licenses left in your archives and you try to download for one more after that (the seventh)? You’ll get a message telling you that you can’t do that. Does that mean you can only have it on six devices ever? you’ll free up the license. That license will go back to your archives, and be available to other devices on your account. You can remove the book from a Kindle by right-clicking on the title in your homescreen, and choosing Remove from Device. The reader apps may use other methods, like right-clicking or “long-touching” or possibly using a menu. Remove it from the device, sync with Amazon and you free the license. It’s against your Terms of Service with Amazon to sell or give away (to someone not on your account) your Kindle with Kindle store content on it. Just make sure you Sync & Check before you give it away or sell it (after deleting the content), so Amazon knows you’ve freed the license and can return it to your archives. What happens if your Kindle is lost/stolen/fails? How do you regain that license? Let them know what happened: they can restore your license. Remember that this only works with Kindle store books, not books from other sources or personal documents. That’s one of the big advantages of getting books from the Kindle store…you get the Kindle service. It does work with some other items from the Kindle store as well, although it won’t work if the device can’t use the item at all. For example, it works for active content, like games, but not for the reader apps or the Kindle 1. It works for issues of magazines and newspapers, but currently only for the Kindles and Android phones (and only certain ones on the Android phone, I believe). There are some rare variations. If you bought a book from the Kindle store and it turns out the book had to be removed by Amazon for legal reasons (such as it infringing on someone’s rights), they have to remove it from the cloud (your archives) as well. If you have local copies (copies you have downloaded to a device), Amazon won’t remove those…but you won’t be able to download from the cloud to any of your devices again. I think this ability is one of the best things about the Kindle store. It’s a much better arrangement for us than buying a paperbook, since four people in our family can read the same book at the same time for one download price…even in different places. I used the number four, because that’s what we actually have…you could typically have six for simultaneous reading, and an unlimited number for sequential reading. Let me know if you have any questions about this. Also, if you’d like to comment about this use of graphics, I’d appreciate that. I assume some of you are going to like it…but I want to judge whether or not it’s worth the effort in the future. Audible ate my Amazon password! Wow, I am mad about this one! I wanted to look at the new download from Audible thing. I tried to log into Audible…I assumed I had a separate Audible password at some point (I’ve looked at it before). I couldn’t put in a password that worked…so I asked for a password reset. It reset my Amazon password! I’ve had that Amazon password for many, many years! I like that Amazon password! I can’t have it back (the system won’t let you pick one you picked before, and the rules for passwords have changed)! The Audible site did not tell me it would reset my Amazon password! I will be letting Amazon know about this! I would certainly not have intentionally changed the Amazon password…I’ll admit to a certain nostalgic attachment to it. I know it’s safer to change your password periodically, but Amazon would not have made me do that (it would have been my choice) if I hadn’t gone to Audible. Audible is owned by Amazon (has been for about three years, I think), so there should be a BIG GIANT WARNING that if you change your Audible password, it will change your Amazon password. I’d love Amazon to give me my old password back, but I don’t think they can or will…they’ll be sympathetic, I’m sure, but my old password doesn’t fit the new rules. UPDATE: Okay, now this is getting serious! My Amazon Associates password didn’t work…so I entered the new one I created for Amazon.com. Rather, I tried to do that…but it appears to be too long! Sigh…I’ll have to work on that. My emotional reaction to it isn’t Amazon’s fault, but this is certainly not user-friendly.